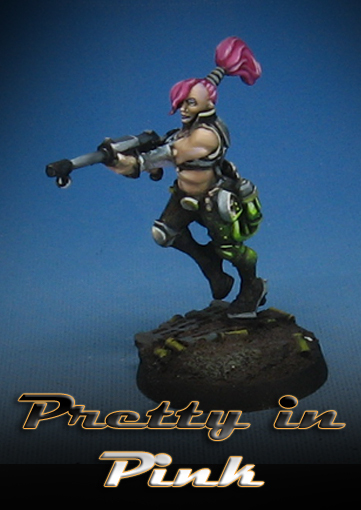 We near the end of the Clan Escher Necromunda gang, and one more hairdo! I have been gathering up entire squads of figures, from fantasy, sci-fi and other genres. These will be a big part of the upcoming painting tutorial videos that I am creating right now. New pledge levels have been added to the Patreon Page to reflect this, especially in the "army painting" category. The idea is to record a multi part video series which demonstrates in detail the process of painting and basing a squad or unit of figures. While there are a lot of videos out there showing how to paint one piece of a figure, or one in isolation, there is not a lot of content out there which covers painting multiple figures, especially to the highest levels. These will be done in both oils and acrylics, showing how a variety of materials can be used. That should give you many more options in your own approach. I want to include the basing in order to show the best way to create playable bases for your figures that still look like tiny dioramas. At the lower pledge levels, you will get links to the videos as usual on YouTube. Higher levels include "hard copy" versions on USB drives, and even the miniatures themselves. I will be introducing this more thoroughly in a separate post next week!